One of my favorite young men (2nd cousin) Peter graduated from high school this spring. His passion is baseball (just like his father). I found this cool vintage baseball image on Etsy for $1.00 and thought it would make a perfect card for him. I love the way it turned out. First I inked the Impression Obsession Stripe Stamp with Versa fine ink making sure there were some blank lines to give it more of a vintage feel. You do this by rubbing the ink on instead of blotting. I learned that tip from Wendy Vecchi. 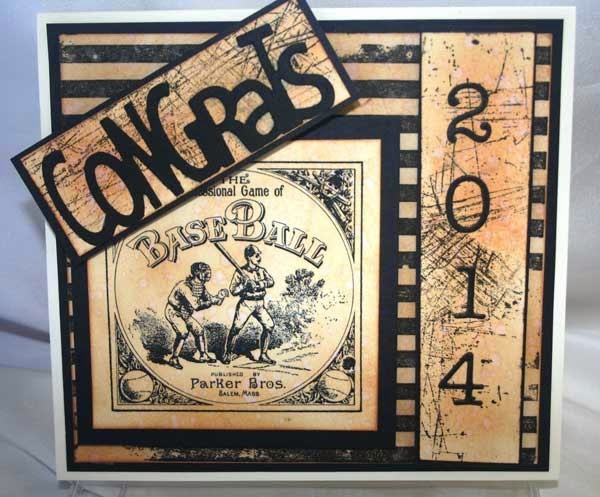 I stamped on the background of the Congrats and the year. I love that stamp as I think it adds so much interest. I am sorry but I don't know which set of numbers I have. I think it is Memory Box but I did not label it. (shaking my finger at myself) I personalized the inside too with a graduation cap and a note to Peter. I think he will like it. Numbers - I think Memory Box, but not sure. Wow!!! Joan I love this card! You totally nailed vintage! Great card Joan, you know we can't forget the guys in our lives and they are the hardest ones to design a card for. You nailed this one. Perfect design for a young man...he will treasure it I am sure...I need to make more "manly cards!!! Awesome masculine card Joan, your nephew will love it!